Lucky for us, Junyi said yes. Junyi, who lives in Los Angeles, tells me she works mostly in colored pencils and likes to play around with scale and layers. 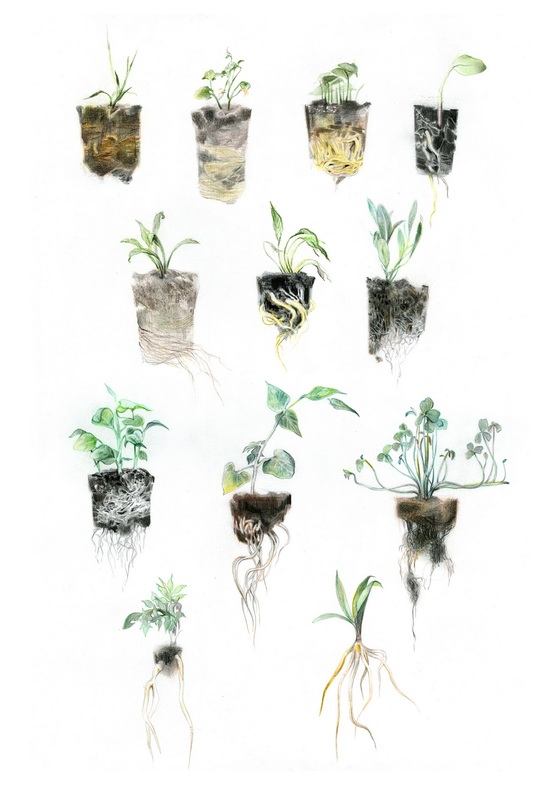 Below are some of her pieces—delicate, ethereal, otherwordly, and breathtaking, I think, in their clarity—and, when you’re done looking, raise your hand if you fell for them hard like I did. Here are some Junyi links, if you like what you see here and want to see even more: her website; her blog; and her tumblr. I’m just gonna hush now and let her artwork do the talkin’. Oh, except to say: Notice how I categorized this post under “picture books.” Junyi isn’t published yet, but hey, I can dream. Right? All images reproduced by permission of Junyi Wu. 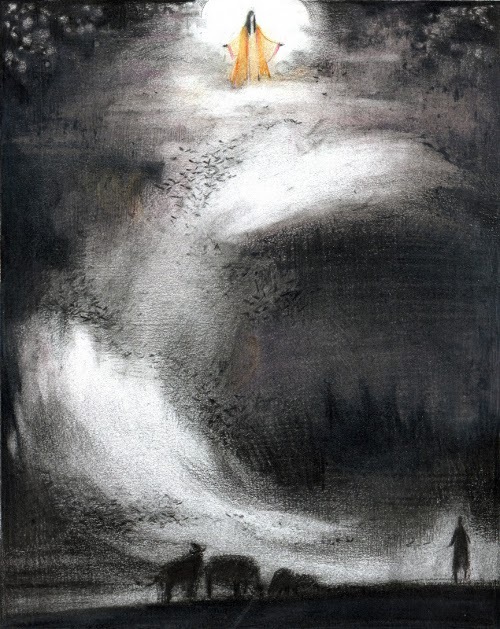 1) If I haven’t already made it clear, I like Junyi’s artwork a whole heapin’ lot. 2) Fudge pie hot from the oven. Which is what is happening as I type this, kick #2. The idea came from the six-year-old’s made-up book, called The Pie! It’s about cats baking pies. That’s right: Show me a book called The Pie! and I start foaming at the mouth and digging through the pantry. 3) Check out these literary paint chips. If you run your cursor over the titles of each color, you can read more about each. 5) Last night I went out to eat and had margaritas with three of my favorite friends, and it was a wonderful break from manuscript revisions. 6) So was Slings and Arrows. Finished Season One on Netflix in just a few days — a couple episodes late at night each night after getting work done. Such a great show. 7) It’s Fall Break for my girls—Already? Yes, already!—and we’re adventuring. More on that later. Very beautifull work. 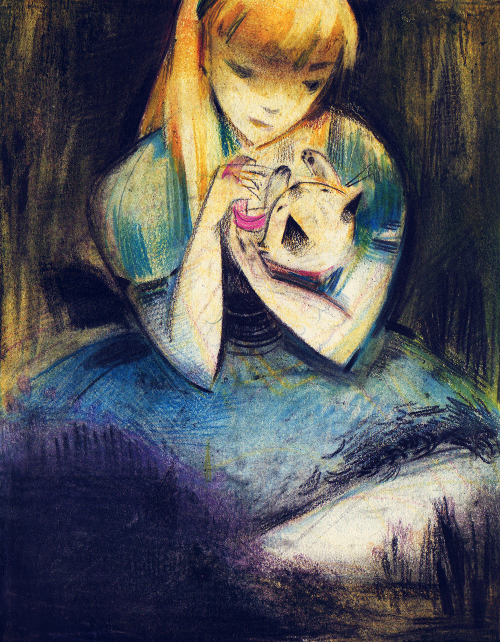 I love Alice and the fox.. I am hoping someone notices the work of Junyi Wu soon. I particularly loved the foxes and plants. Colored pencils…amazing. Jules: Fudge pie and dinner with friends–both sound great. Hope the revisions are going well. Also that video made me laugh and laugh. 1. I saw The Master on Sunday night. It was excellent, though also difficult to watch. 2. Then last night, I saw Looper, which I enjoyed in spite of its flaws. 3. I finally started watching Game of Thrones this week. What a fantastic adaptation! 4. My BFF left lunches in my fridge for me two days this week. They were delicious and made my life much easier. 5. People keep looking at my house, and we have an open house today. Maybe someone will finally buy this thing. 6. Great picture books: Count! by Agnese Baruzzi and Goldilocks and the Three Dinosaurs by Mo Willems. 7. Couple work wins: had a good meeting with the developers who will be creating our new web site and sent over our 2013 budget proposal. Had much help with both efforts. Junyi’s work is stunning. I especially love the moon drawing. Jules, hooray for fudge pie and time with friends. Margie, the leaves are beginning to change here. Adrienne, fingers crossed that your house sells soon. 1. To be posting here after missing a couple of weeks. 2. Book club meets tonight. Peace Like a River is the book. 3. Completing a week of school since the car accident. 4. My family and friends. 5. The warm beginning of autumn. 6. My panels for CYBILS poetry. 7. Nominations for CYBILS opens tomorrow. Lisa: Dang. That poem is impressive. Alexandre: Yes. Beautiful, huh? I like the foxes and, like Margie, I’m partial to those plants, too. The jellyfish may very well be my favorite. Margie: Fall colors! I noticed a tree in our backyard yesterday — that it’s mostly still green but then there’s one splash of orange in the front. … How’d you like The Quiet Place? I should check your blog. What’s your book club reading? I’m nosy, huh? Adrienne: I have not heard of The Master and must fix that. I’m ever-so curious about Looper. Congrats on your work wins, and I wish I could snap my fingers and have someone buy that house already. That car wreck! ACK! I am still so glad you’re okay. Did you get a new car yet? My goodness, thank the stars you are healthy and in one piece. Junyi Wu: Hello there! So glad that Jules reached out to you. Thank you for sharing your beautiful artwork with us! Your Alice and Dinah piece is my favorite. I hope you find fantastic opportunities and are hired by wonderful people. Jules: Tell your daughter that I said good luck with her book. Do the kittens wear mittens while baking pies? Thanks for the fun lit links. Hello to lisainberlin and Alexandre. Margie: Fall leaves are so lovely. They are lovelier in parts of the world where they change color, like what you described! Thumbs-up for your cloud and moon pictures. Hi to Xena. adrienne: Good luck at today’s open house. I want to see Looper. Time travel! Jone: Glad that you had a good week. Best of luck to you and the rest of the Cybils crew! JES: Thank you so much for recommending The Night Circus by Erin Morgenstern. I enjoyed it immensely and plan to post a review at my blog today. Thank you so, so much. 2) Callback today – Think good thoughts, please! 6) One of my works was accepted and will have a reading in January! oh wow those illustrations are just BEAUTIFUL!!! and unusual too! I’m sure she’ll have no problem with getting published! Jules – literary paint chips! I have to find a room to paint “lilac ocean.” (Maybe I could buy a literary doll house and use all the chips! Oh, wait, the Bronte Sister Power Dolls could live there! ha-ha!) All good speed with your manuscript revisions. lisaberlin – wisteria … more than roses. Liked the poem. Margie – cloud and moon pictures sound difficult, and lovely. adrienne – I saw Looper as well; think I might have to see it again to give it its due. Man, that that kinetic boy was mesmerizing. Sending house-buyer vibes your way. Jone – car accident! Take care of yourself. Good luck with and enjoy your work on the CYBILS. LW – Congrats on upcoming reading, and opening, and call back. Break a leg today. 1. A friend’s son’s 100th Day celebrated per Korean tradition: baby propped up with red & gold pillows surrounded by fruit (pomegranates, oranges, bananas) and iced rice cakes. He looked cutely regal and destined for a happy and prosperous life. 4. Dark chocolate mint M & Ms! 5. Getting ready to workshop my novel at end of October. 7. Heard LA Phil/Gustavo Dudamel conducting, play Rite of Spring last night. Wow. Jules, thanks for once again spotlighting an artist I hadn’t been aware of but really appreciate being exposed to. 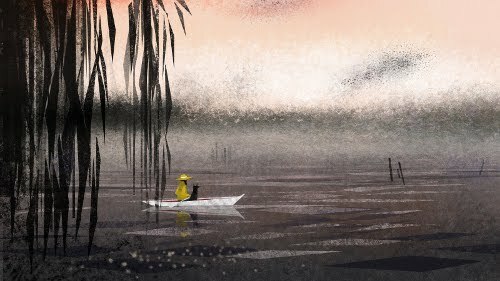 Ms. Wu’s evocative work is beautiful/unique and I look forward to seeing more of it. I’d not seen the Mighty Morphin’ Brontë Sisters before — very funny — so thanks, Jules! 2. Heard an NPR story about this new children’s edition of The Odyssey on Friday. I can’t quite accept the unambiguous “e-books will NEVER be able to do X” assertions (or actually many other unambiguous assertions, now that I think of it). But I do think this looks like a marvelous book to hold in your hands: those Neil Packer illustrations! 5. pop music (of just about all genres, including the ones I never listen to (or recognize, if I do)). 6. This may put me over the “I’m sp*mming 7-Imp” threshold of number of links, but have to admit I love this political ad featuring the reunited cast of The West Wing… in character!… on behalf of a Michigan judicial candidate. 7. Early morning temperatures finally dipping, ever so briefly, down into the high 60s. Makes me want to don gloves and a scarf and make grass-clipping angels in the front yard. Hey, Little Willow: VERY happy that you liked The Night Circus. I had a feeling you might! I’ll look for the review. Oh wow, such lovely images, I am in love with all of them, but especially, Alice, and Moon and super super love Willow, Just gorgeous! I’ve been MIA for a few weeks so happy to have a minute to kick with y’all. Jules – being inspired to bake a pie because of your daughter’s book is simply awesome. Margaritas with friends sounds awesome too. Margie – walking with Xena in the woods sounds so lovely.Hooray for getting a new roof. adrienne – I really want to see both of those movies, thanks for the thumbs up on them. Good luck on selling your house! Jone – Car accident? What?!? Glad to hear you are safe and back at work! LW – thanks for recommending Junyi – her art is so lovely! Congrats on your work getting accepted! Good luck on everything else! Denise – love the image of the pup and kitty in a leg space detente! JES – I’m with LW – thanks for recommending The Night Circus, I am loving it and wishing work weren’t so busy so I had more time to read! And thanks for the Douglas Adams quote – how I wish he were still around to make us laugh even more with more books! 1) Today’s breakfast sandwich – toasted Dave’s Killer Bread with fresh mozzarella, tomato, avocado and veggie sausage – yum! 2) Cole is s-l-o-w-l-y getting better about riding in the car. 4) Some good achievements work-wise. Super busy as a result, but loving it. 5) Sunshine lasting longer than normal for this time of year in the PNW. 6) Kickball double header Friday night – there were jello shots, slides into home plate, and we won both games. Plus, my teammates are really fun and funny. 7) Getting hooked on The Vampire Diaries. Just finished Seasons 1 & 2, waiting for Season 3 from the library. 7.5) Being brave enough to ask for what I want, and getting it. Took a while, but that makes it all the sweeter. Beautiful art. Like Alice, Moon, and Willow in particular. Jules, I’ve got to make that fudge pie. Margie, I’m with you on the leaves! Denise, didn’t know there was such a thing as mint m&m’s. Mmmm. And yay for your novel! Rachel, yay for asking for what you want and getting it! 1/ Spending time with great old and new friends, laughing and telling stories about childhood and motherhood and music and books. 4/ Exchanging crits with crit partners and giving and getting energy and feedback. 5/Cooking black bean soup and grits and pumpkin-apple bread right now, as it is fall! 6/ Feeling a cool breeze, as it is fall! 7/ A great class with my kindergarteners, who were enthralled by watercolors and fall leaves. Jules: Love that video. My 10 year old and I chuckled through it together. Margie: New roof? We are soon to be in that position. Hope things go well. Adrienne: Still sending good thoughts your way on the house. Hope the open house brings the next owner. Jone: Peace Like A River…I haven’t read this one yet, but have now put it on my list. T.Y. Little Willow: Good thoughts atcha for that call back. Denise: I’ve been reading Show Me A Story too and enjoying it. That Korean 100 day celebration sounds amazing. Great visual picture! Rachel: What time should I be there for breakfast tomorrow? JES: Your “grass clipping angels” made me chuckle out loud. Jessica: What time should I be there for dinner? Black Bean soup, grits and pumpkin-apple bread. YUM. 2) Swimming, lunch in park and going to humane society with my 12 year old for an all-day date while my husband took the younger girls camping. …sorry gotta go…my minute is up! Thanks Jules for the great post. Junyi’s work is lovely. Thank you for sharing. I am quite fond of Alice. Jules- I’m so glad you made this emergency-beauty post. I’m also glad you took a manuscript break. Fudge Pie? Fall Break? These must be Southern things, yes? Lisa- I never buy house paint if it doesn’t have a good name regardless of the color. Adrienne- Glad you discovered Game of Thrones series (winter is coming). L.W.-Best of luck with the call back. Thanks for telling Jules about Junyi. Denise- I’ve been wondering about those M&M, must try. JES- I heard that NPR story on my way to work the other day, very inspiring. Lori- I’m jealous of your swimming. Glad you had time with your girl. 1.-6. My three sisters, my brother, most of their spouses and their children were at my house yesterday. We had apple burgers, local beer and birthday cake. There were 17 of us ages 9 months to 52 years. Such a lovely time I am exhausted but smiling. Enjoy the good sleeping weather. Little Willow: Break a leg today! Am I too late? And thanks again for emailing about Junyi. Denise: I knew there were dark chocolate M&Ms, but I didn’t know they had dark chocolate + mint. Mmm. Thanks for the video link, which I shall explore when I’m done typing. And I’ll have to find the Les Miz parody, too. John, the piece you reference is the only one I didn’t have a title for (unless it’s simply TDF). It looks sort of Secret Garden-esque, yes? … Thanks for the Odyssey link. I own that book (but haven’t read it yet), and I hadn’t seen that NPR link yet. [TIME INTERLUDE]. I had to stop and share it on Facebook, ’cause I love Karen Lotz’s quote about how they work with their illustrators and care about art. … I keep seeing that West Wing political ad shared and shared, but I haven’t watched it yet, so thanks for the reminder. 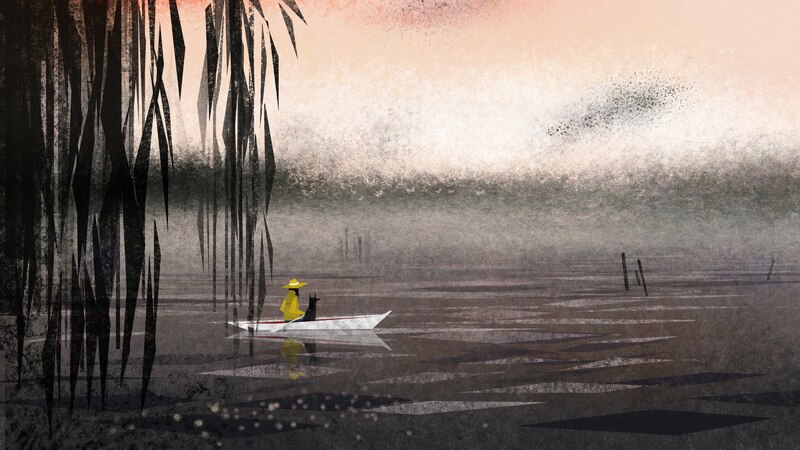 Rachel: The Willow piece reminds me of Jon Klassen. 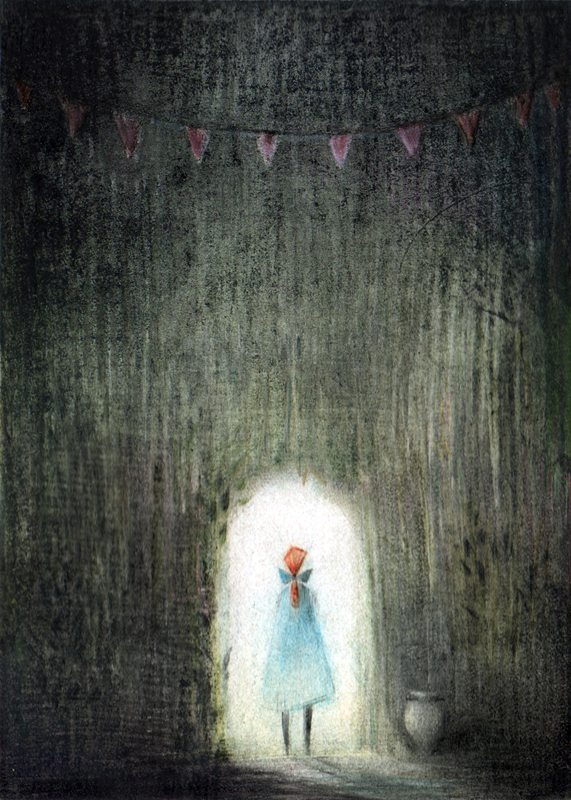 And the very last one reminds me of this previously-featured artist at 7-Imp: http://blaine.org/sevenimpossiblethings/?p=2162. … Kick #3 is very wise and oh-so true. And I’m still jealous of your kickin’ kickball team. Kick #7.5: YES! Cool. Jess: Dancing and drumming at the birthday party. Brilliant! I’ve never heard of combining pumpkin and apple, but yum. And those kindergarteners are lucky to have you as their teacher. Moira: Emergency-beauty. Love that. And fudge pie is Southern? Please don’t tell me you’ve never had it?? Fall Break is not necessarily Southern, but to have it so early is. Also, how much do I love that you don’t buy the house paint if it doesn’t have a great name? … Let us know how the book is! I’m intrigued by it, too. So glad you had fun with your family. I have never had fudge pie. Now that I have looked it up to see what it is I want a piece…now. Mmm pie. I smile every single time I see that picture of Alice and Dinah. I want that as a poster, or a postcard I can stick on my fridge, or something. Rachel: Thank you! Give Skittle a hug from me. I freaked out when one of my pets lost a tooth. It fell out as you described, just straight out, and she was fine. Congrats to you and your teammates. Most of all, congratulations on asking for what you wanted and then getting it. High-five! Jessica: Happy birthday to your 7-year-old. Yay for the fiddle and the feedback! Lori: Thank you. Kudos to you and yours for supporting the humane society. Jules: Never too late. Every piece of support helps. RE: Time interlude: Can I have a time-turner necklace, or a turn in the TARDIS, please? Everyone: It’s time for another Book Fair for Ballou High School! Set up by Colleen, aided by Powell’s Books, you can click through the wishlist there and donate books to the Ballou High School library! Wowee – beautiful drawings. Thanks, Jules! 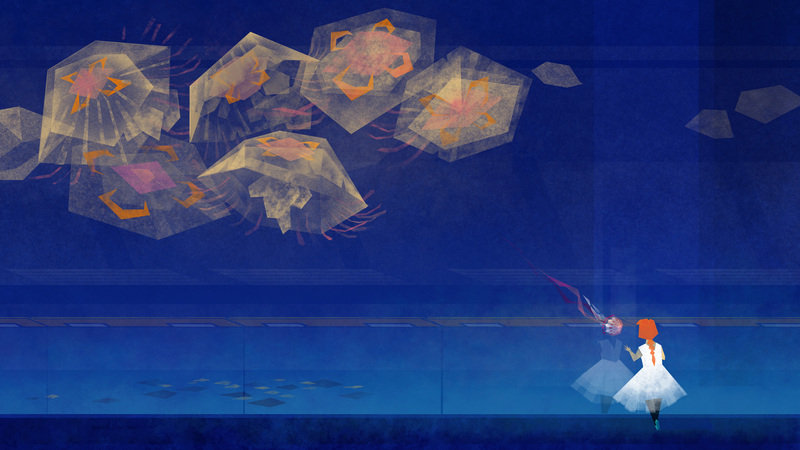 I LOVE Jellyfish – expanded is even more gorgeous. What a blue. The reflection of the girl’s face is a jelly. The literary paint chips were very clever. I’d love fudge pie if I wasn’t alergic to chocolate. My husband and I laughed ourselves silly over the Bronte sisters video. Our son didn’t get it at all, but laughed almost as hard as we did just because we were laughing. Thank you for that. The poem – what words, thanks for sharing it, Lisa. Everyone else has it going on! I love reading these kicks and have missed my weeks away. 1. The Quiet Place – our household is in love with this book. 2. I spent the day with my Little painting the outside and coloring the inside of his large box that is phase one of his quiet place. I will post a link when I’ve got some photos uploaded. 3. We went apple picking yesterday – hot but fun in the southern California sun. 4. Dinner last week at a charming French Bistro in the even more charming town of Culver City, CA with 6 of the 7 moms who served with me on my Little’s preschool board of directors 2 years ago. 5. Seeing Space Shuttle Endeavor fly over my head at 100 feet last week. I know I mentioned this last week, but just had to say it again! 6. My parents are in escrow! they are buying a charming condo in our beautiful complex here in LA and will be 5 minutes walk through grass and trees. We are so excited. 7. Fast and furious on the novel I’m editing. Some things that weren’t are clicking now. The Les Miserables political parody “One Term More” I watched on Broadway.com. They are real Broadway performers. I’m back to share another kick that I wrote down for this very occasion but didn’t have time to share in my above post. It’s entertaining and I think you picture book devotees will like it. I promise I am not embellishing on any of this…I wrote it down the morning after so I wouldn’t forget it. So Tomie DePaola sat down and snuggled with my three daughters to watch Anne of Green Gables… which was really The Hunger Games starring the red head who plays Anne of Green Gables! Moira: I wish I could bring you a piece right now. And now I’m wondering what the really “Southern” pies are. Do you all have chess pie? Little Willow: Thanks for the reminder about the book fair! If I find any time-turners, I’ll save one for you. Allison: Apple-picking! … Also, I am looking forward to the pics of your son’s own Quiet Place. So glad your parents found a place near you! Denise: Thanks! That was fun. The Nelson Mandela quote says it all, huh? Lori: BWAHAHA! I love it. I think the fact that you had an ms about chicken and whipped cream is my favorite part. I’ve heard of chess pie but have never had it. I am picturing white and dark chocolate chess pieces filling with a checkerboard crust. I do like pecan pie, although I am probably pronouncing it incorrectly. Someone once told me that the name “chess pie” came from Southerners saying “it’s chess pie!” — as if to say, “It’s just pie.” But I have no idea if that’s true. I don’t think she will be unpublished for very long. Beautiful work! So ethereal. My kicks this week include renewed priorities in work and life, going to my first ‘gala’ and walking in the brisk fall weather. Beautiful art. Thanks for showing us Junyi Wu’s talent. Wow, wow, wow. These are beautiful pieces! Beautiful work, thanks for sharing Jules! I like Willow and Jellyfish. I love the ethereal quality of them. Good luck to Junyi! Hope your fall break is going well… ours is next week…. hope everyone else has a great week!